Magento and eMerchantClub: Your Website Will Be a High-Tech Store! What do all of these online retail websites have in common? They all use Magento to power their online store! These companies and many more have spent thousands upon thousands of dollars to create a fantastic online store based on the Magento platform. The more important question is what does YOUR store have in common with these huge brands? You can have a Magento-based online store for a fraction of what they paid! Magento is the #1 provider to the world’s commerce giants with $50 Billion+ in gross transactions annually. It’s so popular because it’s owned by eBay enterprises, the #1 platform for Internet Retailers, and Magento is #2 behind eBay! Magento makes websites mobile friendly, has endless options, is updated with new technology and features continually, makes shopping and check out really easy, and so much more. 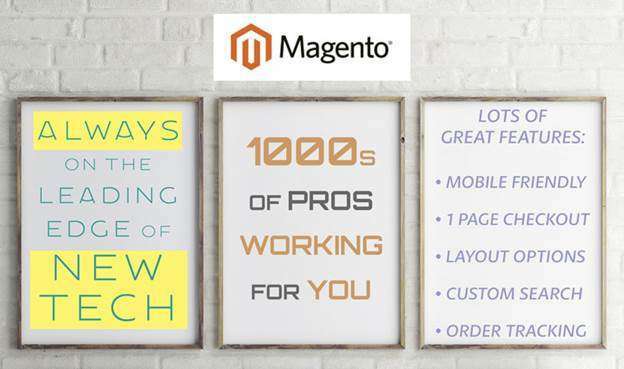 Magento Commerce is supported by a vast global network of 300+ solution and technology partners and by a highly active global community of more than 66,000 developers as well as the largest eCommerce marketplace for extensions available for download on the Magento Marketplace. The Magento eCommerce platform is used by hundreds of companies that take in millions of dollars from online sales, such as Stella and Dot, Christian Louboutin, Rosetta Stone, Oneida, and many more. This is a really exciting development for eMerchantClub stores, which in the past were built on code that we created in house. While our small team was able to make great strides in creating new features for you, with Magento, we’ll be able to deliver all the features and functions that you enjoy currently along with many more updates and improvements from the thousands of developers who are constantly creating new features. The Magento Update puts YOU in control of your online store. You’ll get incredible tools to customize your website that are usually reserved for big brands that spend hundreds of thousands of dollars on their web presence. Once you purchase gift cards for your store, you can send them virtually via email to your shoppers to use on their next order! Post products directly to eBay from your site, and if that product goes out of stock, your listing on eBay immediately disappears so you won’t sell something that’s no longer available! Your shoppers can create an account on your store and log in easily using their credentials. It makes checkout faster and easier! The most common reason for shopping cart abandonment on a website is when the checkout process takes too long. With Magento, your customers will check out quickly with your 1-page checkout system. On the 1-page checkout, you’ll also be able to show your customer additional products they can immediately add to their order before completing the checkout process in an effort to increase the sale total. Pre-populate order information on return orders, helps reduce abandoned shopping carts. The Google API properties, like Google Maps, YouTube, and Google Trusted Store, can be an important marketing piece for your online store. Becoming a Google Trusted Store has proven a 9% increase in sales and an average order size increase of 6% for online businesses. Shoppers who buy from a Google Trusted Store get purchase protection of up to $1,000 guaranteed by Google, and having the distinction of being a Google Trusted Store can improve your search engine ranking with Google. Once your customer places an order, they’ll be able to log into your site to track their order, too! Your website will show them their tracking numbers from the shipping carrier that is delivering their package, so they won’t have to leave your site to find out when their order from your store will arrive. This is automated and makes your website a high-quality retailer. Your website will accept payment from PayPal, PayPal Credit and Authorize.net. This is just another way that we are helping you make the checkout and payment options on your site streamlined so it’s easy for shoppers to spend money with you. Your Magento website will be the most SEO friendly site in eMerchantClub’s history! Thanks to the Magento platform and the incredible SEO tools built in, your store will have all the tools it needs to rank well with Google, Bing and other important search engines. You’ll be able to directly post products from your website to Facebook, and even include comments and information, all from your site manager with no need to open two browser windows and copy and paste to Facebook. You can customize your website’s layout to make it look great on mobile phones. For instance, photo sliders don’t work well on mobile screens, so with 1 simple click, you can ensure that your site’s sliders don’t show up on mobile platforms, which can really help your SEO. Your website will have autocorrect built into the search function to help your shoppers find what their looking for regardless of how well they spell! If there are no search results found, you can create a custom 404 result page for your store. You will have complete control of your newsletters! Send custom newsletters that feature the products you want to promote in a way that’s totally in line with your website’s colors and design. If you choose you can also set up a Mail Chimp account to deliver your newsletters, which is a service many pro stores use to keep track and keep in touch with their customers. This updated feature lets your website automatically send an email reminder to logged in customers who fill their cart but don’t complete the checkout process. You can also offer them a coupon to come back and make their purchase at a discount you choose. Another great Magento feature is that your website will be hosted on Amazon Web Hosting, which is the most technologically advanced hosting service available! For full-line websites, when new products are added, those items will automatically appear on your website without the need for you to initiate the product update. No more logging in weekly to add new products! Your website will automatically hide products that are out of stock to ensure your customers have the best experience possible when shopping your web store! You can easily forward your orders from your website’s admin panel to Smart Living Company as soon as your customer pays for the items they want! Not only will this save time, it also ensures that the products your customer order will be in stock and ready to ship ASAP. Run your online store on the go using the mobile friendly admin. Make updates; manage orders or changes from your favorite mobile device! No more waiting until you get home! Quickly see your top searched items, the last searched terms the top search terms and more in just a couple of clicks giving you the information you need to ensure your site is giving your customers what they are looking for!